Quick confession – while I have made my fair share of egg casseroles I find them to be fairly boring. There really isn’t anything special about it, just eggs, milk and bread. And other stuff but it still never works out to “wow” me. I made this one for Christmas brunch. The biggest draw here was the fact that there was bacon. And cheese. Bacon and cheese make everything better. And it did make this one decent but still no wow factor. But then, maybe I’m starting to be biased. Maybe no egg casserole will ever wow me. I did think that there wouldn’t necessarily be enough or rather that only 6 eggs for a 9×13 pan wasn’t enough but it worked out pretty well I’m glad I didn’t tweak it to add more eggs and milk. Speaking of, I didn’t make any changes to this recipe that I can tell other than I used more cheese than it called for. And I used a taco blend of cheese since that’s all I had. I thought for sure we had some regular cheddar in the fridge but no such luck. I did used 12 pieces of bacon, as it calls for which worked out to be the whole package (one pound). Not sure how that would have worked out if it was a thick cut bacon. I normally buy a thick cut but this package happened to be a regular cut. I also tore the bread up rather than cutting it into cubes. It works the same. So maybe I did make a few changes. It did taste good (it has bacon after all) but missing a “wow” factor for me. 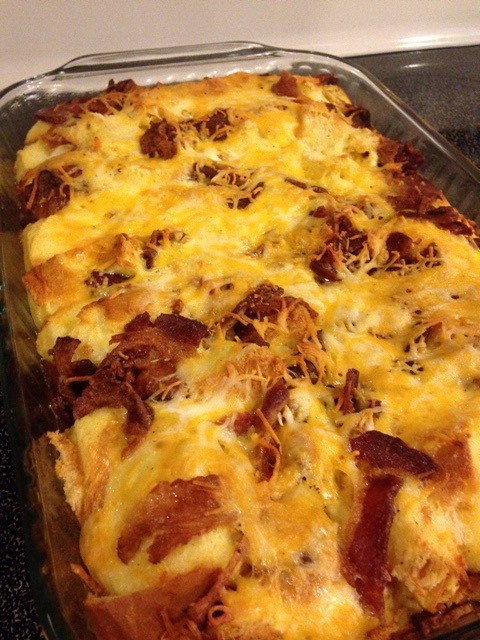 This entry was posted in Bacon, Breakfast and tagged bacon, bacon egg cheese casserole, egg casserole. Bookmark the permalink. I’m not sure what you are looking for to give it the “wow” factor. This recipe is exactly like the one that I make and my family loves it. You can add other vegetables (mushrooms, olives, onion etc.) or use other meats. Sausage, ham, pepperoni are all good. Perhaps add some spice. I think I am just biased against them.